Most beers are made up of four main ingredients: Water, barley, hops and yeast. Throughout the Basics of Beer series, I will address each of these topics individually. Last time, the discussion was about the differences between ales and lagers and an overview of what happens during fermentation. Over the next two posts, I will talk about barley and what it lends to finished beer. This post will give an overview of how barley is processed before it makes it to the brewery. This process is called malting. The basic idea of malting is to take raw barley, allow it to germinate to a certain point, and then stop it before it turns into a new barley plant. Brewers want the starches and sugars of the barley grain, as well as enzymes that will help break them down once the malted barley enters the brewery. Very few brewers still malt their own barley, though historically it was not uncommon. Through the following steps, specialized producers called maltsters create the wide range of barley products used by brewers to add fermentable sugar, color and flavor to their beers. Steeping is the first step in the process. 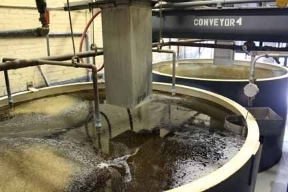 After the maltster receives raw barley from the farm, a large drum called a steeping tank is filled with cool water. The raw barley is added and over the next two to four days the barley will soak up the water, increasing the moisture content in the grain. This begins the germination process, and the same reactions that happen to the seeds in nature are happening inside that steeping tank. Raking is the next step in the process. Once the moisture content of the seeds has hit the desired level, oxygen must be introduced to continue germination. 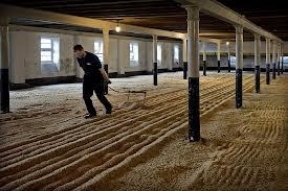 The barley is dumped from the steeping tank onto the floor of the malt house where it will sit for several days. By raking the barley around on the floor, the maltster is getting oxygen to the seeds. During this stage, natural enzymes in the barley seed are breaking down the endosperm of the seed to make starches that, if left alone, would become the nutrients for a new little barley plant. Heat is also produced during this process naturally, and there are stories from the old days of piles of wet malt bursting into flames on the floor. As soon as the first rootlets, called chits, appear at the ends of some of the barley seeds, the maltster must stop the germination process. If allowed to continue, all those starches that were just created would turn into roots and stems and barley plant parts. The process is stopped by drying out the malt very quickly in a large kiln. The moisture content is brought from 45% to around 3% percent within 2-4 hours. This low moisture content is what makes barley shelf safe for up to a year. After the barley has been dried, the maltster will kiln it further to make a wide variety of products. In the kiln, the barley is heated to different temperatures and held at those temperatures for different amounts of time. Maillard reactions are happening in the kiln. Maillard reactions are a browning reaction that is also responsible for making toast. If you were to put a piece of white bread into a toaster for a few seconds it will come out a little yellow and taste a bit different. If you leave it in longer, it will turn brown and taste very different. If you leave it in for a really long time, it will turn completely black and taste VERY different. These same reactions occur in the maltster's kiln. The different amounts of time and temperature that are applied to the barley will create different malts that will add different flavors and colors to the finished beer, later. The range of malt flavor can be from biscuity or cracker-like (very lightly kilned malt) to toffee or nutty (more highly kilned) all the way to burnt or coffee-like (very highly kilned). As the malt is being kilned, the enzymes that the brewer needs to finish the sugar creation process in the brewery are slowly being denatured, or made inactive. Generally, as the malt is darkened in the kiln its extract potential, or the amount of sugars it can yield when brewing, is diminished. Once this final step is complete, the maltster will ship the different products out to breweries where they will be chosen in the right proportions to make any one of the tremendous variety of beer styles.